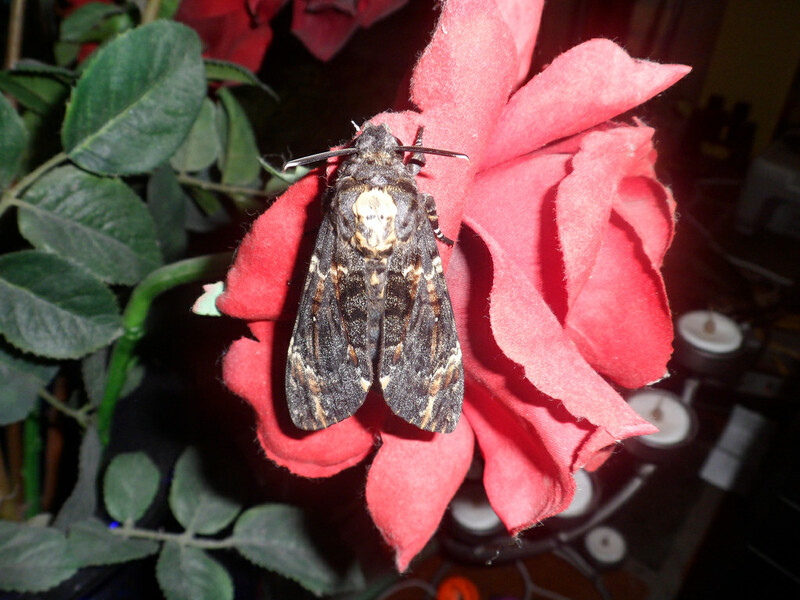 Acherontia atropos — “Deathshead-hawkmoth” | Welcome, visitor! 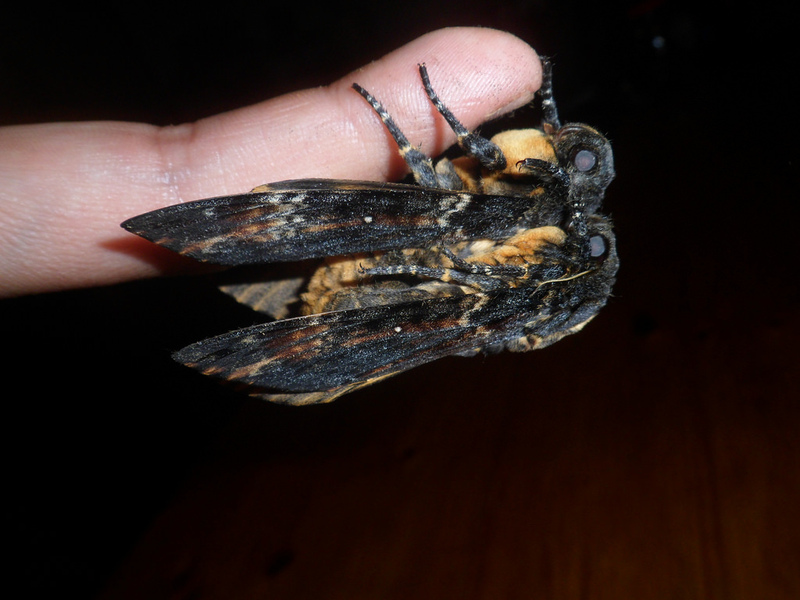 How to breed the deathshead hawkmoth! Dear visitor, welcome to one of the most read caresheets on my website. It is not suprising, since the deathshead hawkmoth (Acherontia atropos) is one of the most popular species in the breeding hobby, and one of the most well known moths in the world; the moth seems to have great cultural significance, originating from several superstitious beliefs and media such as the movie Silence of the Lambs, where the moth has a prominent role. The grim reputation of the moth may partially be due to the marking on the thorax that vaguely resembles a human skull. The moths are also very hardy and easy to reproduce in captivity, even for beginners, and can be encountered in most parts of Europe. Next to the fact they are large and beautiful, it is not suprising this species is popular with experts and beginners alike. Generations: Multivoltine (continuously brooded – no overwintering, although pupae can go in a prolonged period of dormancy if kept cold, in the long run this will damage their vitality and development). Prefered climate: Prefers hot and dry environments (African continent, parts of Spain and Greece) but seems to be able to handle more temperate climates (Central and Northern Europe, Russia) aswell, which do not seem to be out of its comfort zone – they even reproduce here. However, the moths do not survive the winter in these regions – the inability of the moth to overwinter at low temperatures seems to be the limiting factor. Special notes: Adults can squeak. 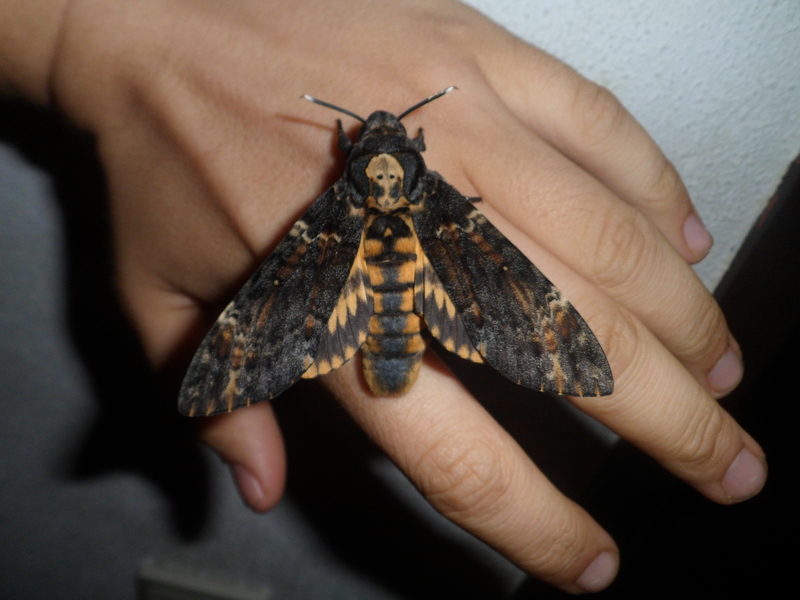 Acherontia atropos, also known as the “Deathshead-hawkmoth”, is well known and notorious due to the part it has played in the famous horror movie “Silence of the Lambs”. They have a grim reputation, and in many cultures they are considered evil creatures – often labeled the souls of the dead, evil spirits, or a dark omen. This is probably due to the fact that the marking on the thorax of this moth resembles a human skull. Combined with the fact they can squeak loudly and are quite large many people will regard them as eerie and unnerving insects. 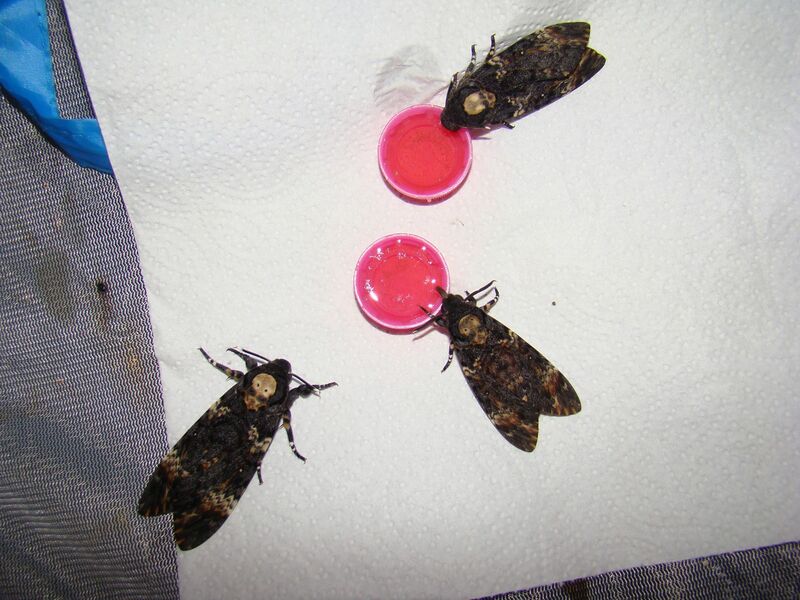 They couldn’t be further from the truth though, as Deathshead-hawkmoths are quite harmless and fascinating. Originating from the continent of Africa and parts South-Europe (Kreta, Greece, Spain) the deathshead hawkmoth is a large species of hawkmoth that prefers warmer climates. Interestingly, the moths are excellent migrants and can be found migrating all the way from Africa to North Europe and Russia, where they are spotted in countries such as France, the Netherlands, the United Kingdom, Eastern Europe/Balkan, and Russia. Here they are also able to reproduce themselves here during the warmer months of summer and autumn – the larvae are sometimes found on potato, nightshade or privet – but interestingly they are unable to survive the cold winters of Central and Northern Europe. This means that every winter, their remaining populations in these parts of the world are systematically wiped out as most moths and larvae succumb and die in the cold weather. The populations in Greece, Spain and the continent of Africa are able to survive and often repopulate Central and Northern Europe again after migrating there in summer. This means they can be found all year in Africa – producing continuous generations. Their host plants consist of a large selection of nightshades (Solanaceae) – among which are potato, tomato, tabacco, deadly nightshade and many more. Apart from nightshade they also feed on plants from the olive family (Oleaceae) including privet, ash tree, jasmin, lilac and more. They have also been reported to feed on cannabis and sometimes oleander. In the wild, larvae are most frequently found on Ligustrum, Fraxinus, Solanum sp. (potato and tomato are very suitable), generally Oleaceae and Solanaceae. Also reported on Cannabis and Buddleia and are renowned for being able to feed on the more toxic kinds of nightshade. 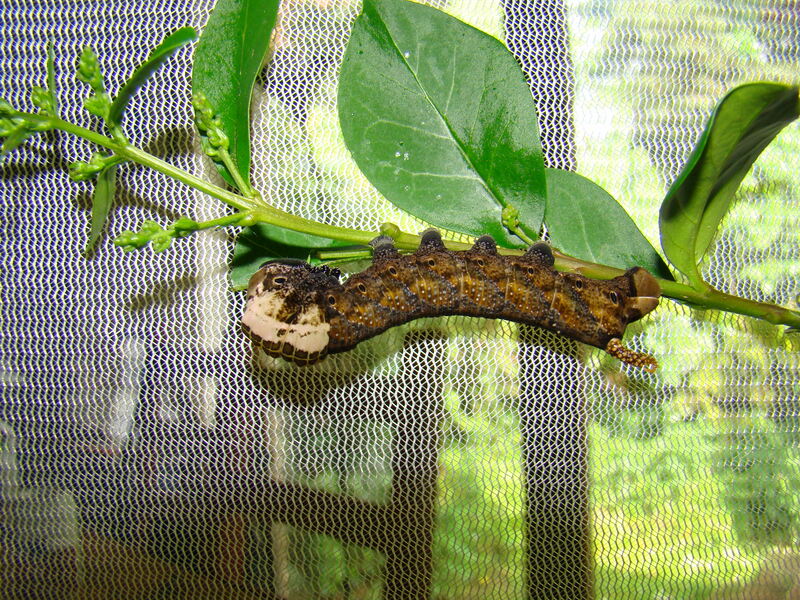 The larvae of Acherontia atropos are usually fully grown (from egg to pupa) in 1 to 1.5 month, depending on the temperature; reasonably fast for a large moth species, though generally speaking hawkmoths generally seem to have faster development times than moths of a similar size from other families (such as silkmoths, eggars or tiger moths). The fully grown larvae will descend from their host plants and burrow into the soil – here they will pupate, after constructing an underground pupal chamber. 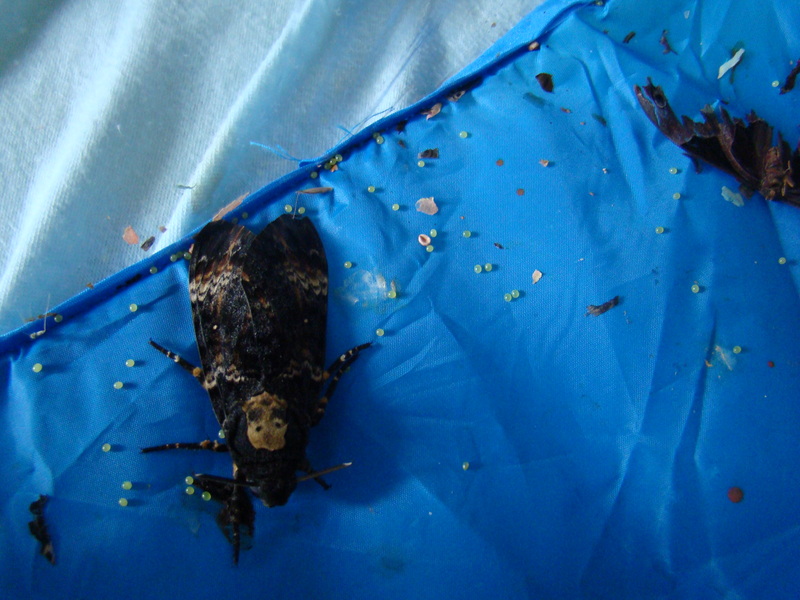 After about 1 to 2 months time (again depending on temperature), the adult moth will emerge. The life cycle starts with pale, transparent yellow eggs that only a few millimetres in size. 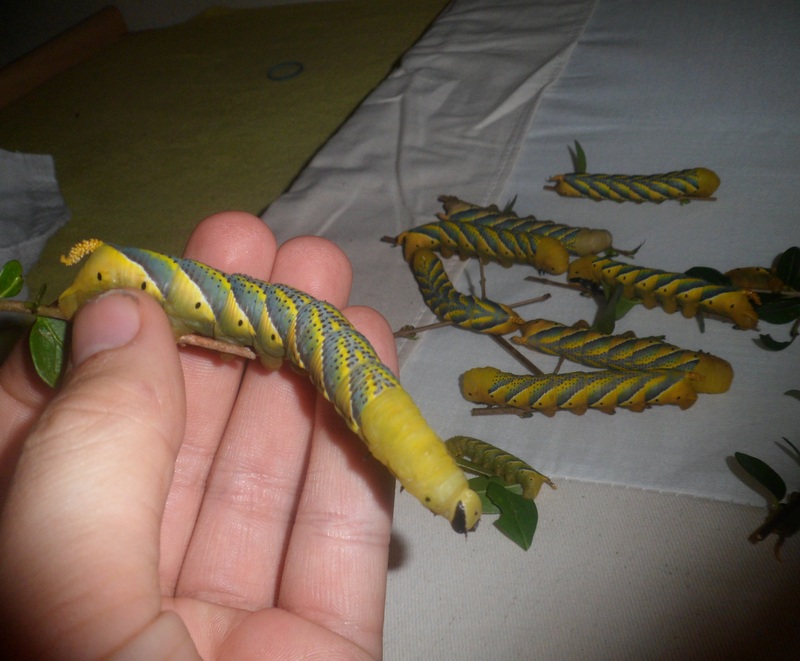 The eggs of the deathshead hawkmoth with usually hatch between 5 and 10 days, entirely depending on temperature. In a hot environment, the development of Sphingidae eggs can be suprisingly fast. In a colder environment it may even take up to two weeks before the eggs hatch. After hatching from their eggs, most larvae will consume a part of their own empty eggshells. This first meal provides them with some kinds of nutrients that are harder to derive from their food plant, and more importantly, it gives the young larvae enough energy to wander around, looking for a correct place to settle. The young larvae will wander a lot before calming down and settling down on their food plant. Then, after some time, they will begin to feed. The first instar larvae will feed voraciously for a few days. But it doesn’t last long, for after eating a lot, they are ready to shed their skins to the next phase: the second instar. 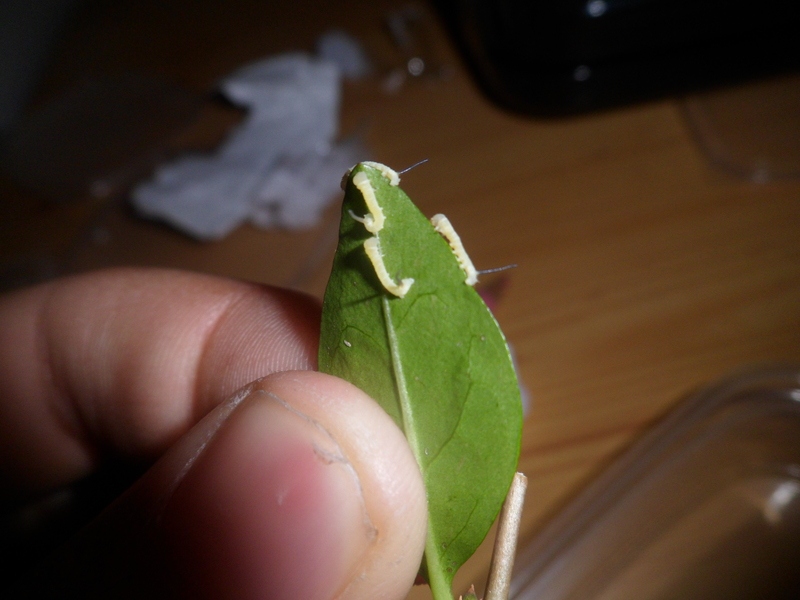 How fast this happens depends on the temperature, but it is very possible to get the larvae from the first to the second instar within a week. This is when they become slightly more colourful and get a bigger appetite. The first two instars can be reared in plastic boxes, ideally. However, after growing bigger the larvae require more space and ventilation. Usually I move them to cut food plant in water bottles after the third instar. 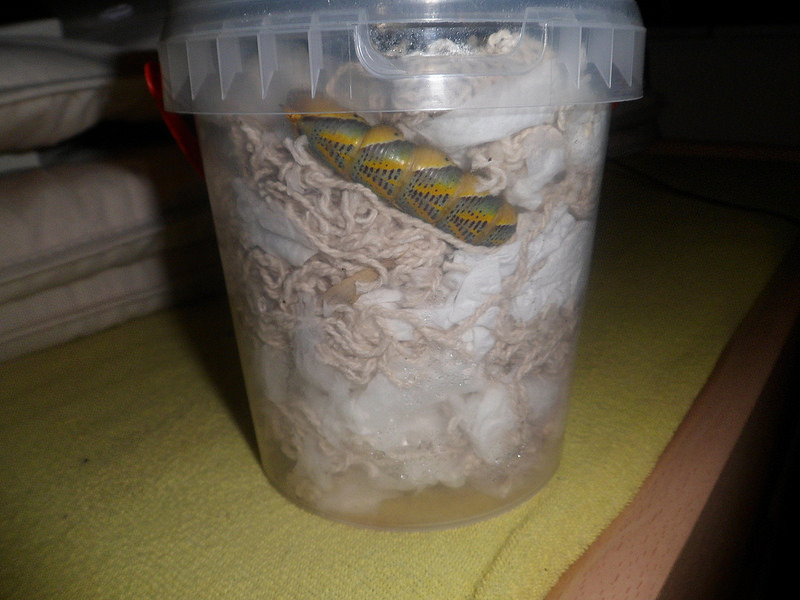 In captivity, the majority of Lepidoptera can get infections and diseased if reared in airtight plastic boxes. In spaces that are not well ventilated, bacteria and fungi can easily grow. The excess humidity from a lack of ventilation aids this process aswell. 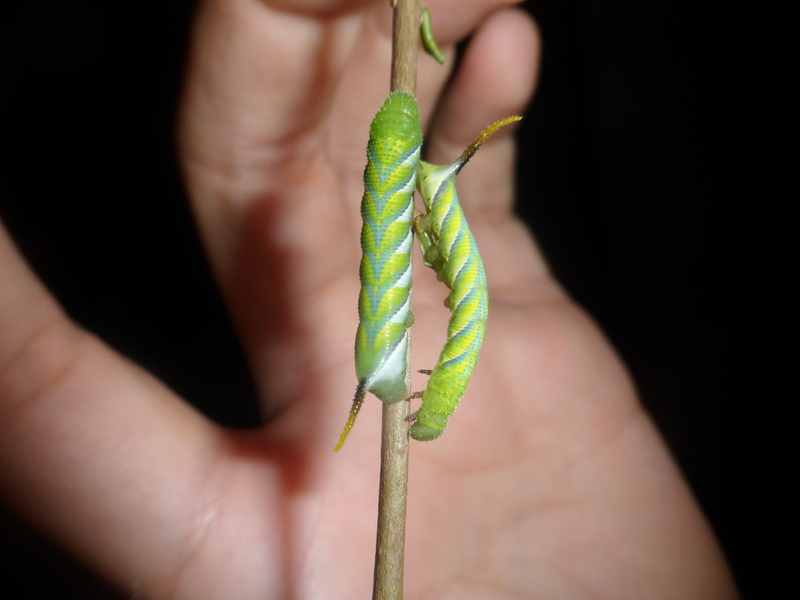 From the third instar and beyond, the larvae become more much more colourful. From the third instar and beyond, the larvae will consume huge amounts of leaves. Be prepared to regulary change their food plants if you have a large amount of larvae. Keep them well ventilated; they can be reared in cages made from netting, in rearing sleeves, in open boxes with no lid (make sure they cannot climb the surface – glass could work) – and alternatively in plastic boxes aswell. Though airtight plastic boxes are not optimal and you have an increased risk of infections and diseases, the species is very hardy in captivity and may still make it with succes. In total, the larvae will go through five instars during their development. 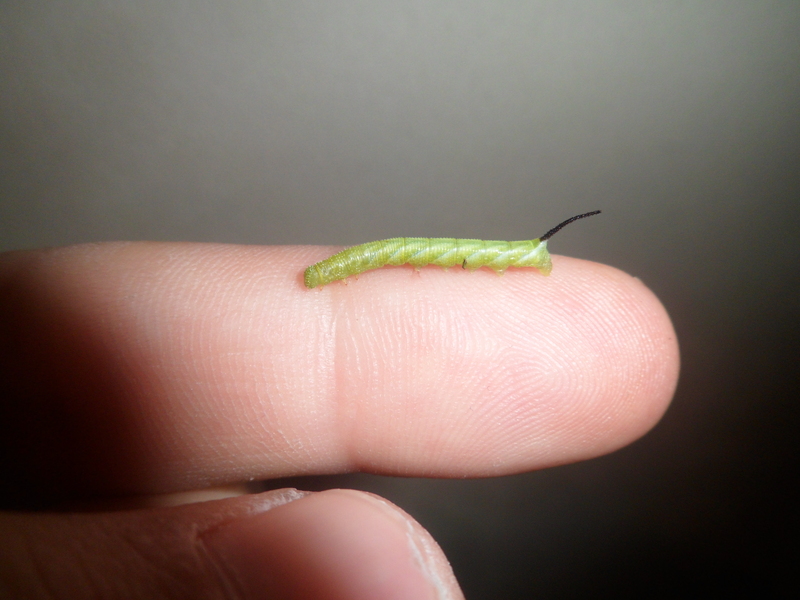 The fifth and final instar is the final one before the larvae will decide to pupate. 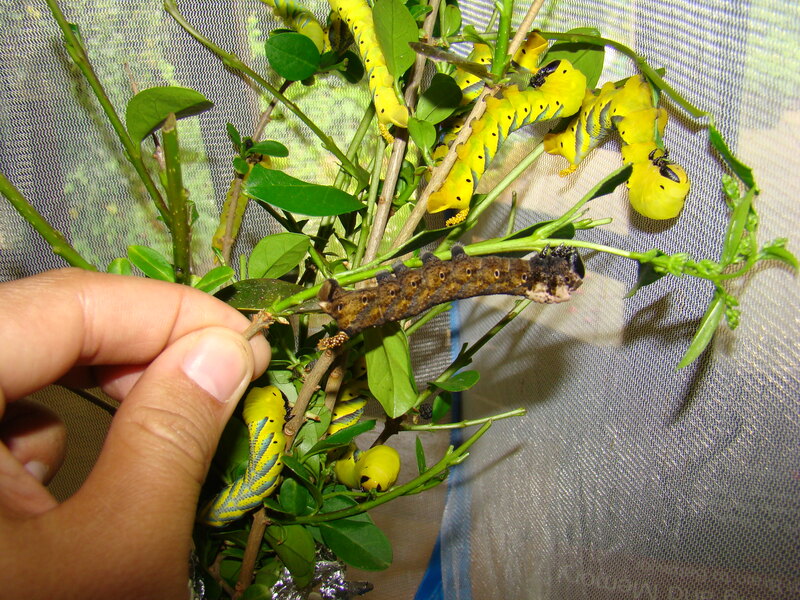 When fully grown the larvae can be well over 10cm – they are quite large (over 13-14cm in some cases!). 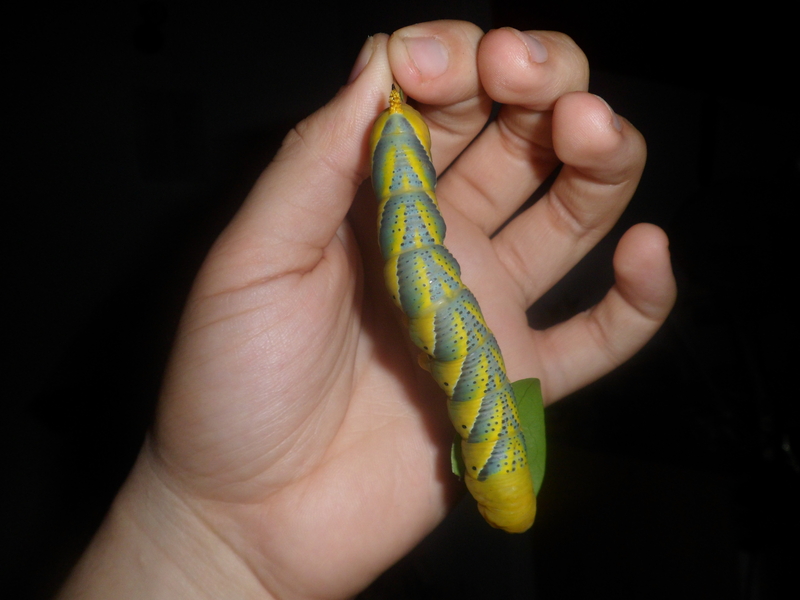 Like many species of Sphingidae, the larvae exihibit polymorphism and have different colour forms. However, it seems that the vast majority of Acherontia atropos larvae assume the common yellow form; this explains why the majority of the images found online and in literature only display the yellow larvae. 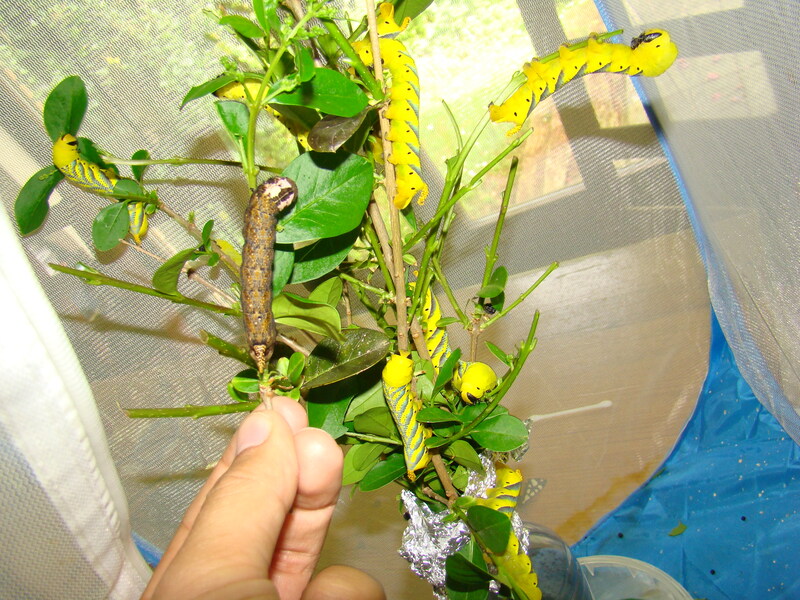 The larvae of Acherontia atropos can however be either yellow, green or brown. The green and brown form seem to be rare, and the basis of their colour seems to be genetic (not triggered by their environment). Interestingly, the brown form of Acherontia atropos is only observed in the fifth and final instar, while the green form can be observed in all life stages. There seems to be no scientific research that confirms the exactly origin of the polymorphic larvae of Acherontia atropos, though we know their colour forms are triggered by genetics, not their environment. Here I have a proposed model of the origin of the polymorpism in the larvae of Acherontia atropos (click here!). 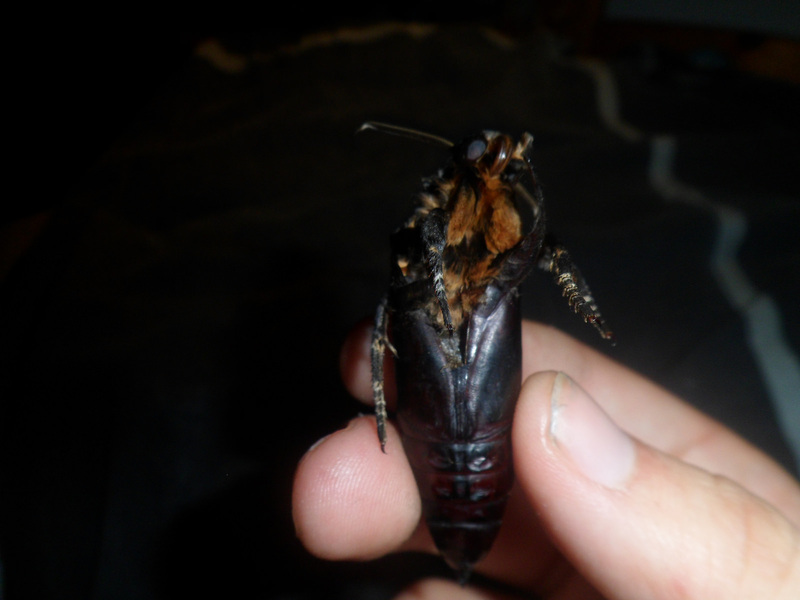 This page is about the biology and life history of Acherontia atropos, so I will not clutter it by speculating about the genetic origins of their colour forms. But if you are interested, click the link for my personal opinion (not scientifically confirmed). 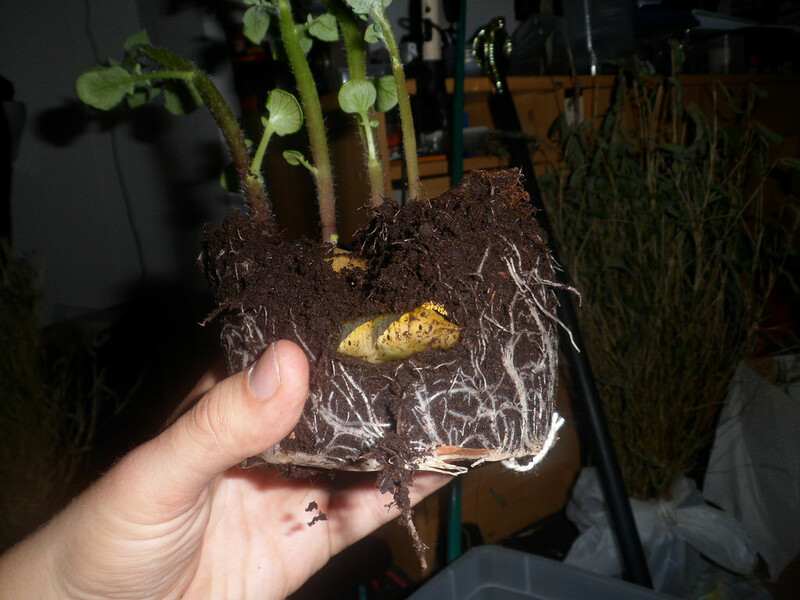 The best host plants for Acherontia atropos in captivity seem to be Ligustrum, Fraxinus or Solanum (potato or tomato). While a wide range of host plants have been described, not all of them have the same succes ratio of young larvae making it to adults. 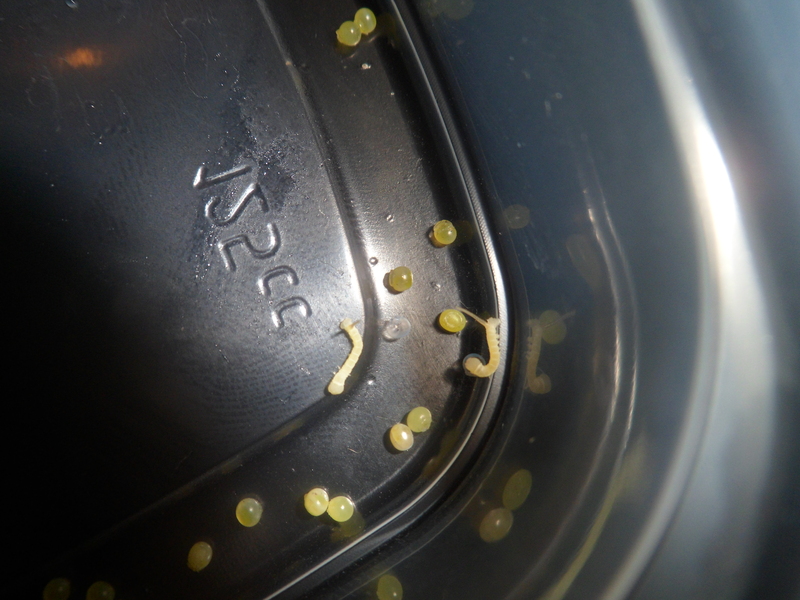 Finally, after reaching their final instars and feeding for a few weeks, the larvae are fully grown. At this point, they will turn very dark and assume a orange/brownish shade – their prepupal camouflage. This is especially visible along their backs. The larvae will also look very “glossy” as if covered with wax. In the wild, the larvae burrow in the soil and pupate underground. In captivity they can be provided alternative substrates such as shredded paper towel, vermiculite, bird nesting material – but of course, actual soil works aswell. When they have burrowed, it is important to leave them alone and to not disturb them during the pupating process. The larvae do not pupate instantly; instead they spend 7 to 14 days in their larval form underground. In this stage they will evaporate excess moisture and prepare to shed their skin; once their skin bursts, a pupa will reveal itself. After about 14 days, it is safe to dig up the fresh pupae. Pupae are wine-red in colour, but they gradually darken as the moth develops. First, the pupae wine-red to orange. In the first stage of development, you will notice that the eyes start to darken. The eyes, the most complex organ that Lepidoptera have, is the first part that will start to develop. 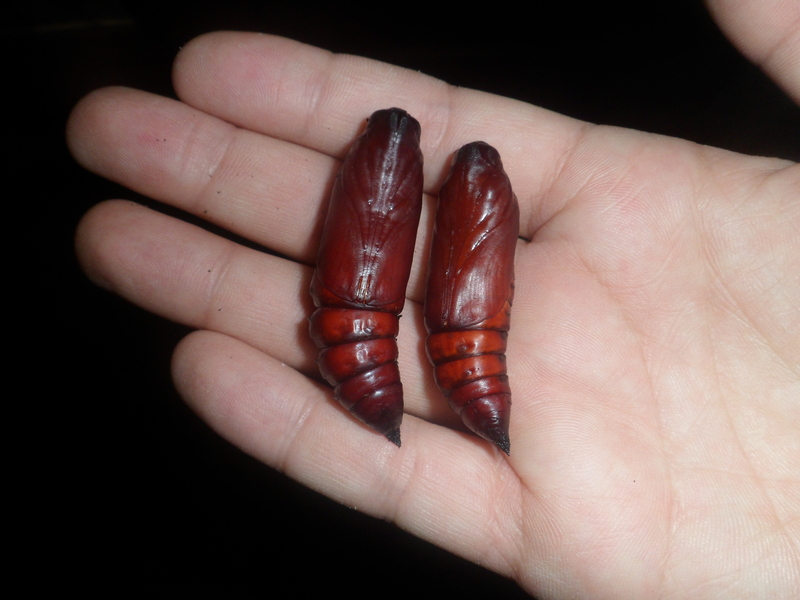 Then gradually the entire pupa will turn dark red to black as the adult body forms. 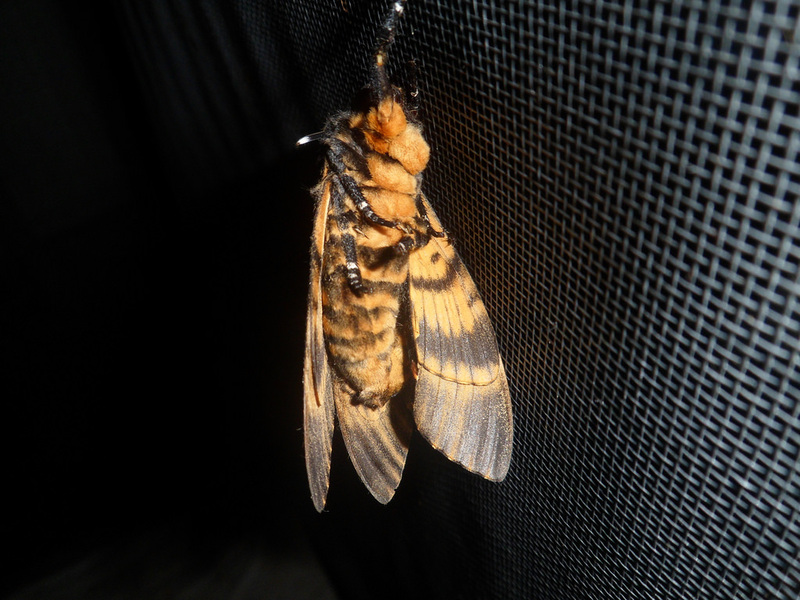 When emerging, the moths will climb up, and seek a spot to inflate their wings (they need to hang to do this). The adult moths have a very unique lifestyle, for they are able to infiltrate beehives, and consume the honey. They have been morphologically adapted to do this – research has revealed they emit pheromones that are very similar to bee pheromones, used to distract the bees while infiltrating the hive. They may also produce a loud squeaking noise which is said to mimic the sound of a queen bee. This also explains the “skull” marking on the thorax which upon closer examination is actually quite similar to the face of a worker bee. Clearly, the adults mainly rely on feeding on honey from beehives, and have several adaptations that allow them to do so without the bees attacking them. 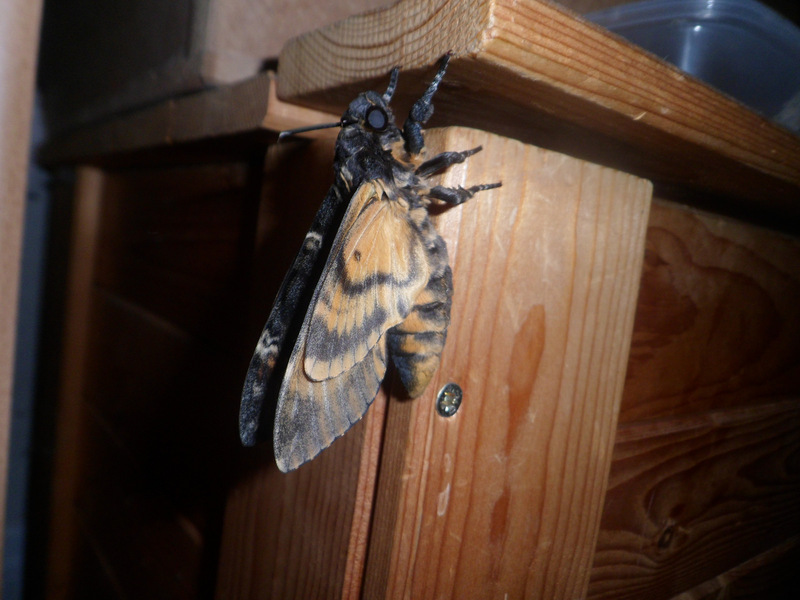 As mentioned before, the adults of Acherontia atropos have an unusual lifestyle for a Sphingidae. Instead of feeding on flower nectar, the adults infiltrate beehives and steal their honey! In order to do this, they have several adaptations that allow them to enter beehives without being attacked. They have pheromones that are similar to those of bees; they can emit a squeaking sound that sounds similar to a queen bee, and the skull on their thorax represents a bee worker. However, this isn’t failproof, and it seems that the adults sometimes still are discovered and attacked and killed by the bees (dead moths can be found in beehives sometimes!). The adults will not feed themselves in captivity. As you have guessed, the best food for them is honey – but not pure honey, a honey/water mixture (50/50) is perfect for them. You will, however, have to extend their proboscis by hand (use a stick or a needle!) and place their proboscis in the honey/water solution. Upon tasting it they will start to feed. The adults will get used to the process if done often. The first few times however they may struggle a lot and refuse to feed; in later stages they will co-operate more, as if they have learned to feed in captivity, and know what is coming. Freshly emerged moths will have little interest in food, generally it is best to start feeding after the moth is 3-4 days old. They will not immediately pair and lay eggs; though the process is easy. However, it seems that the males take their time and prefer to mature a little before copulating with females. Generally, the males will pair when they are about a week old (sometimes earlier). The females don’t seem to care however. I have seen males copulate with freshly emerged females. Copulation happens at night. It’s important to give them a dark and well ventilated environment. Do not disturb them too much at night, give them a breeze or a little airflow (in front of an open window?) – and not too cold, but room temperature is fine – and getting pairings will be easy. 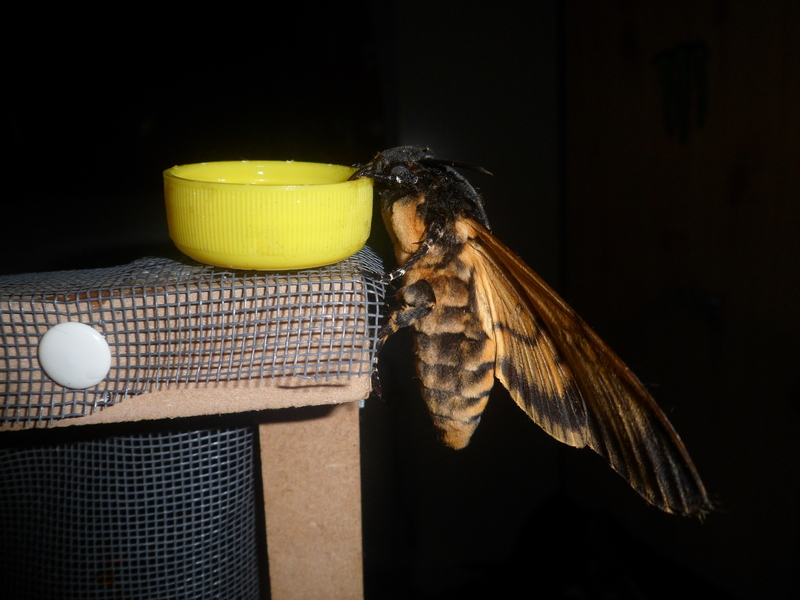 The pairings of Acherontia atropos are unpredictable and can be in the weirdest of positions, it seems that this species is not so “vanilla”, so to speak. Sometimes multiple males can be observed trying to copulate with one female. If they are well fed, females of A. atropos can lay over 150 eggs, in some cases even multiple hundreds of them if they are well-fed and cared for and are allowed to live out their extended lifespans. A. atropos does not need host plant to lay eggs on, they will randomly lay them randomly all over the surface in a cage. However, if host plant is provided they prefer to lay on this instead which may make it a lot easier to collect all the eggs that are not scattered through a cage. They do prefer to lay them on rough surfaces instead of slippery ones. Life cycle completed. Pupae will usually emerge in about a month (or two), once again greatly influenced by temperature – the warmer, the faster they develop. The pupae are however also able to go into dormancy for a prolonged time if not provided enough warmth. But it seems that in the long run, keeping the pupae cold and dormant will damage their vitality and development. Thus I would like to avoid the terms “overwintering” or “diapause”. To me it seems that the pupae are able to survive cooler temperatures that are out of their comfortzone if they are faced with them (this can happen, even in the hot and tropical parts of the world) – which makes sense in case of unusally bad weather. But a prolonged period of cold may potentially kill them, and they are certainly not able to survive frost. Hi I currently messaged you on facebook I watched your rearing video on the larvae I was wondering if you have and suggestions on an incubator and where would I get privet if there is no place where I live can I order some? Hmm… do you use a PC or smartphone? I find them to be creepy, especially the ones here in Jamaica. Shivers mon! I want to know if it is poisinouse? Hello,how long doe they live? ***Where does one find resources for purchasing the eggs or caterpillars??? I’m in Oregon USA and am an avid moth lover; all big and beautiful species! Once I have successfully raised a few generations, I plan to sell the eggs at our Halloween haunted house!! One of the sections of the haunted house is Silence of the Lambs with actual living Death’s Head moths! I live in Darwin, Australia and was hoping to buy either eggs or caterpillars, does anyone know where I can get these?